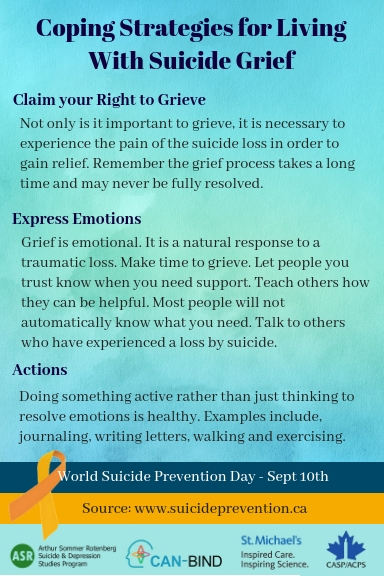 World Suicide Prevention Day (WSPD) is held on September 10th each year and is organized by the International Association for Suicide Prevention (IASP). This year, the Centre for Depression and Suicide Studies at St. Michael’s Hospital, hosted a public awareness booth at Yonge-Dundas Square, Toronto to raise awareness about suicide, suicide prevention and ongoing research in mental health. The booth featured multiple interactive elements to engage passersby and provided a platform for visitors to speak to a professional, seek resources and share messages of support and hope using artistic mediums. 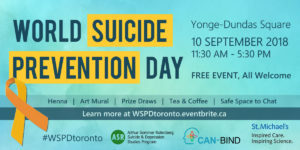 Giveaways included universal suicide prevention awareness ribbons, LED tea light candles, inspirational quote magnets and a chance to enter into a prize draw to win a one night stay and breakfast for two at the Chelsea Hotel, Toronto. Read activity highlights and download resources below. 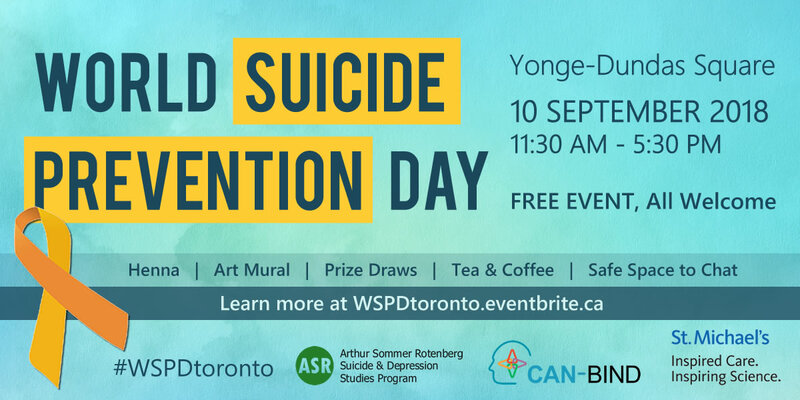 A 10ft x 4ft art mural was set up and booth visitors were encouraged to write, draw on, and decorate the art mural to show their support for suicide prevention, to remember lost loved ones and/or to share messages of hope and unity for survivors of suicide and suicide loss. Visitors had the opportunity to try the ancient form of South Asian body art called henna or “mehndhi” to express symbols of hope and support for those struggling with or affected by self-harm, depression and/or suicide. Maaheen Mushtaq, a professional henna artist and mental health advocate was on site and applied a range of traditional and visitor-inspired designs. Maaheen Mushtaq, a professional Henna Artist (pictured, above), applied a range of traditional and visitor-inspired designs. Booth visitors can be seen having their henna applied and showing the final result. 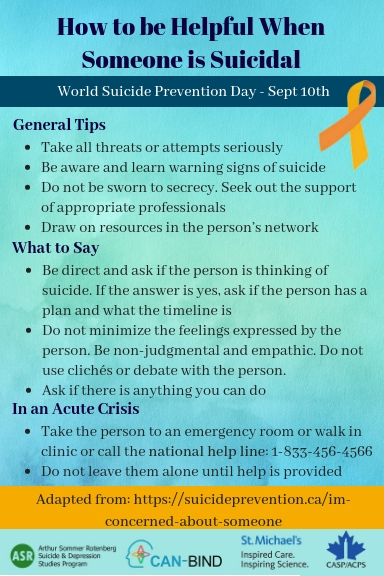 Did you know depression is the most common mental illness in people who die by suicide? Our Fact or Fiction game allowed visitors to learn about statistics relating to depression and suicide. The game also answered common questions such as whether or not promising to keep someone’s suicidal thoughts a secret is okay and whether or not brain chemicals such as serotonin play a role in suicidal ideation and behaviour. Want to test your knowledge or help increase awareness? Download our Fact or Fiction cards here. 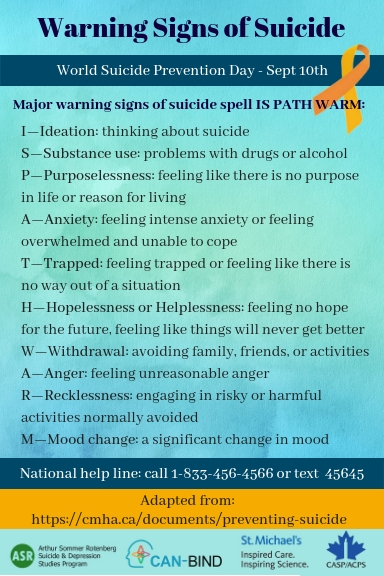 Talking about suicide can be very difficult, but starting a conversation with a few simple questions and knowing what warning signs to look out for can help to save someone’s life. 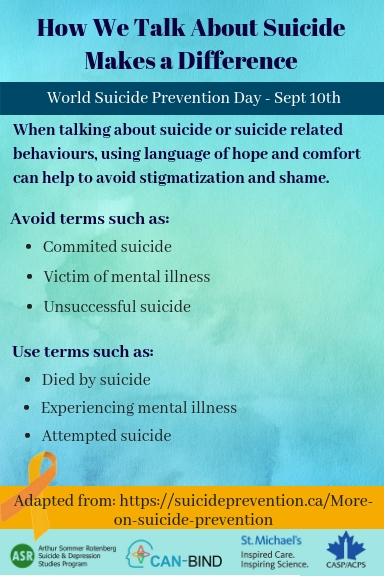 Dr. Sakina Rizvi (Research Scientist), Amanda Ceniti (PhD Candidate) and Troy Chow (MSc Candidate) from the Arthur Sommer Rotenberg Suicide & Depression Studies Program (ASR) were available to answer questions relating to mental illness, trauma, suicide risk and prevention and more. Dr. Rizvi is also a trained 408-help line responder at the Toronto Distress Centre and was able to provide emotional support and crisis intervention for visitors when needed. Dr. Sakina Rizvi, a Research Scientist from the ASR and trained 408-help line responder at the Toronto Distress Centre (pictured, rightmost) was available alongside her team to talk to visitors about research, tools for suicide prevention and awareness and provide emotional support and crisis intervention if needed. Information about the ASR and Canadian Biomarker Integration Network in Depression (CAN-BIND) program’s research, ongoing studies and outreach initiatives was provided. 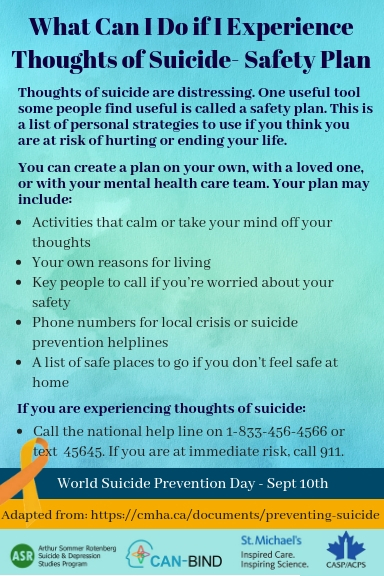 Take-away WSPD resources included handouts for individuals who may be suicidal, survivors of suicide loss and visitors hoping to help survivors of suicide and suicide loss. Click on the slideshow icons below to view, save and download printable versions. A pocket size list with local and national support helplines and websites was also available and can be found here. Thank you to all who visited our booth and participated in our creative activities. We hope that we helped to raise awareness and empowered our visitors and others to speak more openly about suicide loss and prevention. Have any photos or thoughts you’d like to share with us? Tag us on social media @ASRlife_SMH and @CANBIND or email us at [email protected]. 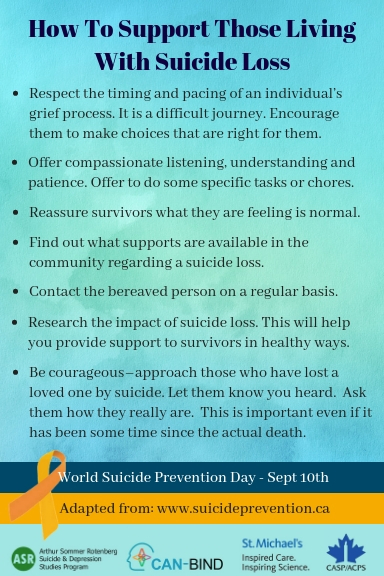 Learn more about World Suicide Prevention Day and stay in the loop about our upcoming public events by signing up to our newsletter on the front page of our website.